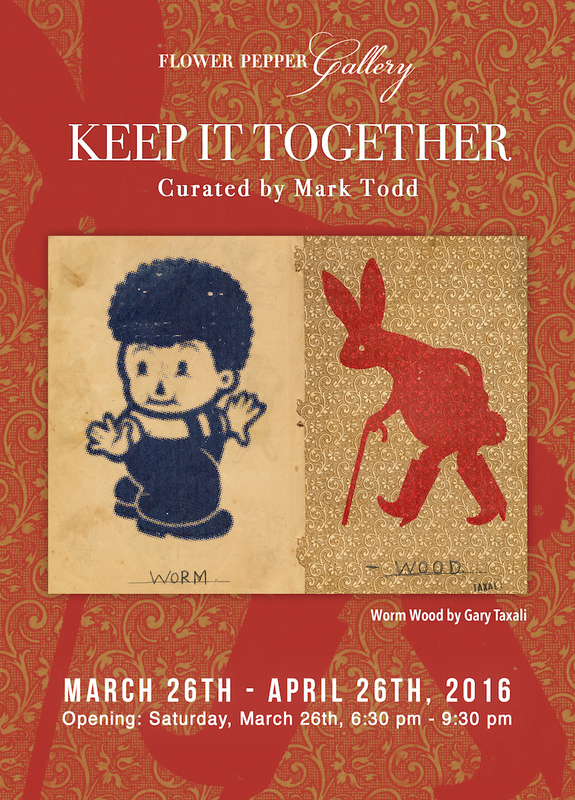 On Saturday, March 26th, Flower Pepper Gallery is pleased to present, Keep It Together curated by Mark Todd. This impressive group exhibition features work from both up-and-coming recent graduates as well as award-winning professional artists whose careers have spanned decades. While visually this ensemble of artists is diverse, collectively they are all storytellers, giving the viewer a glimpse of an underlying narrative. This is Mark Todd’s third exhibition with Flower Pepper Gallery and each time he has brought together artists whose work can stand-alone while also having a conversation with the work of others. Much like his wildly anticipated Post It Show at Giant Robot, now on its 12th year, Mark’s curating style is immensely creative with a vision for inviting artists and viewers into a space that is as fun as it is insightful and provoking. The shows themselves reveal the collective pulse of artists who explore and forge their own unique styles and voices. The title of this exhibition, Keep It Together, not only refers to the group nature of this show, but it acknowledges a feeling that many are currently experiencing. The phrase itself is positive and uplifting but it denotes an undercurrent of unrest that comes during times of uncertainty. Many of the artists in this exhibition produce work that at first glance appears light-hearted using shapes and colors that are fantastical and wild. Yet, within these works there is something compelling that speaks to those feelings of unrest and validates their importance. Participating artist Gary Taxali has shown in galleries all around the world. His satirical retro-style has been described as “reinvented pop art.” His tongue and cheek illustrations are immediately appealing but while his work is brilliantly simplistic, they are rich with meaning derived from current culture. Likewise, Alex Gross finds inspiration from society, and with visual hyperbole he reveals what many try to ignore. With stunning technique he is able to manipulate icons and celebrities to start conversations about what we as people hold dear. On the other hand, Seonna Hong’s richly layered paintings create worlds that are both whimsical and somber and feel much more self-reflective in tone. The characters that exist in her work appear to be exploring their environment as if in a dream. Her work ranges from hopeful to melancholy but each tells a tale of discovery, either of joy or of pain. While Seonna Hong’s work is subtle in style, Misaki Kawai is anything but. Vibrant colors and loose, bold shapes combine to create images that are at once child-like and sophisticated. Finding inspiration from her daily life and travels, Kawai interprets her experiences and filters them through her iconic style. The result allows us to re-examine how we identify objects and beings around us, reducing images we thought we knew into the most minimalistic forms. This exhibition houses many artists of different styles and backgrounds but they all have something in common. The ability to tell stories and create narratives that uplift and challenge viewers to see beyond and look beneath. Finding the humor in unexpected places and finding meaning in daily life are just a few of these stories that remind us of ways we can all Keep It Together. Click Here to view photos from Opening on Saturday March 26th.